To enter the giveaway, leave me a comment telling me what the average size quilt is you make. I've discovered it's so much faster to make baby quilts. duh! GIVEAWAY CLOSED. Thanks everyone for your comments. It was fun to see what everybody else works on. Sarah Z . . . you've won this give-away. I'll be emailing you for your address. Congratulations! I like the make larger quilts, at least 60x60, so adults can use them as couch quilts. 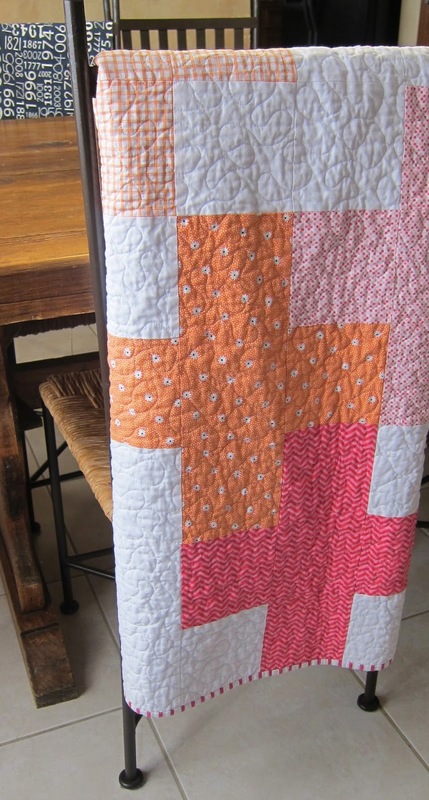 I love your simple plus quilts! I admit I prefer large quilts at least 60 x 75 or bigger. I want my quilts to tuck under my feet and go all the way up over my head. I'm a beginner and have only made wall hangings and baby quilts. I love around 40"x40" sized quilts, maybe as big as 50"x50". One day I'll get brave enough to try a larger one. I only get to sew for an average of 20 minutes a day, so thus far the larger ones are daunting enough to prevent me from starting! I try to always make at least twin-size quilts now. I think it's because I feel guilty having such a addictive and expensive hobby, so it's my attempt to justify it by making something very practical for my family. Thank you for doing this giveaway! How nice! The biggest quilt that I have or will ever make is a lap quilt, and this is only because I hand quilt and that takes time. I do love to make baby quilts too and I have found out that another friend is expecting so that makes 4 stork deliveries in the very near future, so I had better start planning baby quilts!! I'm in love with it too so simple, but good!! Oh, I laughed so hard about your comment of your realizing the love of making baby quilts, this size fits me quite well, whether its a crazy quilt for the wall or for little ones! 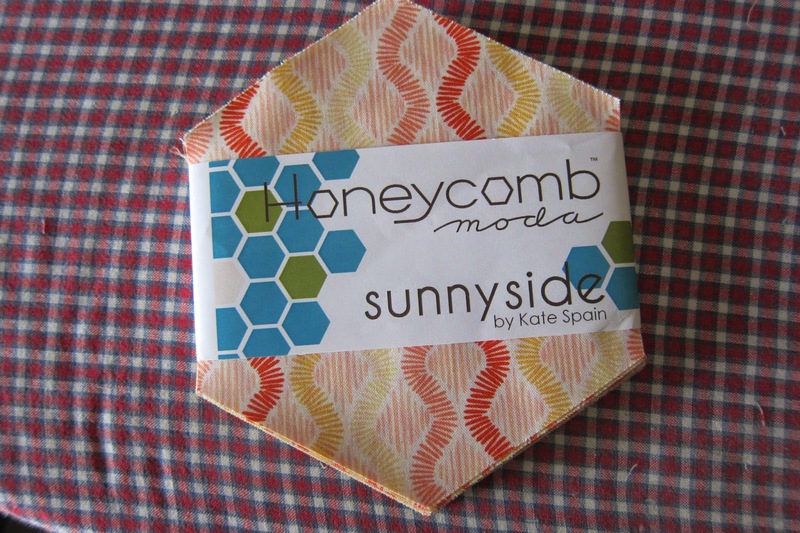 Thanks for this giveaway, I'd love so much to try out the purchased precuts of hexies! I mostly make wall quilts, not bed quilts. My usual size is somewhere between 24 x 24 inches, and 48 x 48 inches. I love making crib quilts too! 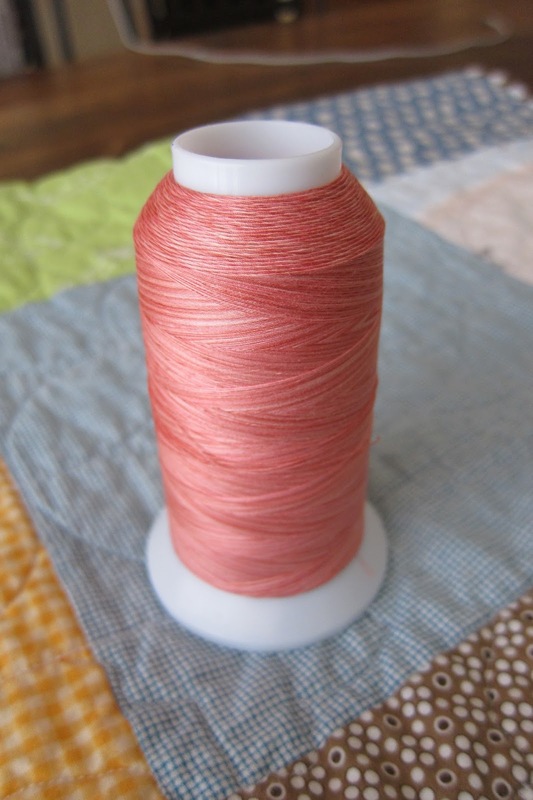 Love your plus quilts-I have the fabric for one on my cutting table-pinks and orange similar to yours but all Kona solids! Beautiful colors in your plus quilts! Love the brights against the white. I mostly make baby quilts too - it's so nice to be able to quickly finish. I do throw in a lap quilt every so often too just so I don't get stuck in a rut. I love your pink plus quilt! I like small quilts - baby or lap sized! Well, I swear there have been at least a dozen babies born this year, so I have done almost nothing but make baby quilts. I make them about 42 X 42. I love abay quilts too. They are so fast!! Twins are good too. Beautiful quilt! I have to make a plus quilt sometime :) My favourite size is baby or throw size - somewhere between 40 - 60" square! Lately I've been making 2' x 2' wall quilts. Composition and quilting just feel so much easier to manage at that size! Baby quilts are the most common I make, but have made some throw size as well...I am working on a king size quilt top-we will see if I ever get around to finishing it, because that would mean it was time to quilt it-and that terrifies me!!! Oh my gosh yes, it is absolutely WONderful! Pink and orange...what is not to love and so simple and bright! Most excellent! My quilt sizes are all over the place...if I possibly can, I like to make them at least long enough to cover someone on the couch :) Except for baby quilts of course...sweet giveaway!!!! Thanks! Lovely work on the quilt and so easy to change for a boy or girl. I love how your plus quilts turned out. I tend to make quilts larger than twin bed size. One of my current tops finished is between queen and king size. I have no idea how I want to quilt it yet. I almost always make baby sized quilts. I've made a quilt for a queen-sized bed, but it was a challenge to quilt. 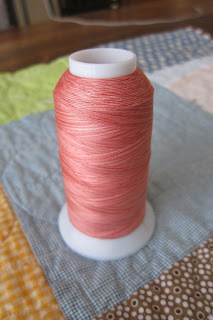 I was just starting ti contemplate a quilt with those colors...yours looks great and reaffirms my musings! I've only finished two so far, one throw size and one crib size. Just finished piecing one that is probably queens size. 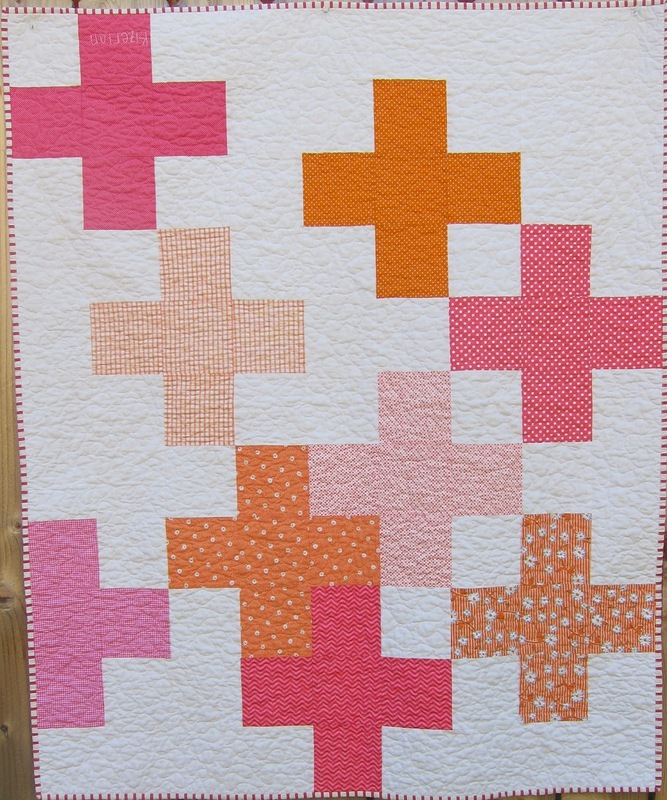 Love the colors of your quilt and the negative space. Thanks for the giveaway!